Knee replacement surgery - also known as total knee arthroplasty can help relieve pain and restore function in severely diseased knee joints. During knee replacement, a surgeon cuts away damaged bone and cartilage from your thighbone, shinbone and kneecap and replaces it with an artificial joint (prosthesis) made of metal alloys, high-grade plastics and polymers. The first artificial knees were little more than crude hinges. Today you and your doctor can choose from a wide variety of designs that take into account your age, weight, activity level and overall health. Most knee replacement joints attempt to replicate your knee's natural ability to roll and glide as it bends. 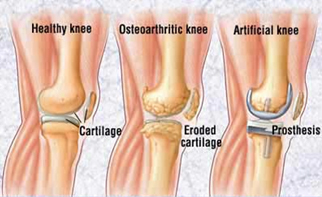 Knee replacement surgery can repair damage from osteoarthritis and other inflammatory conditions. 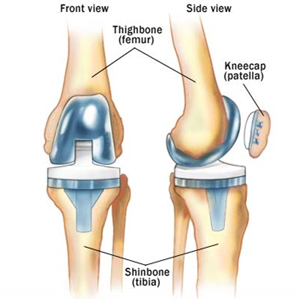 The artificial joint has metal alloy caps for your thighbone and shinbone, and high-density plastic to replace eroded cartilage within the joint and on your kneecap. 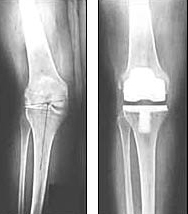 X-rays of an osteoarthritic knee before and after knee replacement surgery. A knee replacement can decrease pain and disability in people with knee problems caused by osteoarthritis, rheumatoid arthritis and other degenerative conditions, such as avascular necrosis - a condition in which obstructed blood flow causes your bone tissue to die. You have pain that limits activities such as walking, climbing stairs and getting in and out of chairs, or you experience moderate or severe knee pain at rest. You have limited function or mobility, such as chronic knee stiffness and swelling that prevent you from bending and straightening your knee. You've tried other methods to improve symptoms, for example, resting, weight loss, physical therapy, a cane or other walking aid, medications, braces and surgery, but they've failed. You have a knee deformity, such as a joint that bows in or out. You're age 55 or older. Knee replacement is typically performed in older adults, but it may be considered for adults of all ages. Young, physically active people are more likely to wear out their new knee prematurely. For those people, a doctor may recommend continued nonsurgical treatment or suggest an alternative surgery such as arthroscopy, leg straightening (osteotomy), or a partial knee replacement, which replaces fewer components than does a total knee replacement. You're generally healthy. Good candidates for knee replacement are typically healthy, without conditions such as restricted blood flow, diabetes, or infections that can complicate surgery and recovery. Obesity alone won't disqualify you from surgery, but it may slow healing and increase your risk of infection after surgery. Risks of serious complications are rare. Fewer than 2 percent of people undergoing knee replacement surgery experience serious complications. Put another way, for every 100 knee replacement procedures, one or two people will experience serious complications. Infection is an ongoing concern. Even years after surgery, bacteria can travel through your bloodstream and infect the surgical site. If antibiotics fail to clear up the infection, you usually need one surgery to remove the infected joint and another surgery to install a new one. Your chances of a good or excellent outcome that reduces pain and improves function decline with each additional surgery. Another risk of knee replacement surgery is failure of the new knee joint. Subjected to daily stress, even the strongest metal and plastic parts eventually wear out. You're at a greater risk of joint failure if you're a young, obese male or you have complicating conditions. An orthopedic surgeon - a doctor who treats muscle and bone problems - performs knee replacement procedures. Before the procedure, the surgeon takes your medical history and performs a physical examination to assess your knee's range of motion, stability and strength. An X-ray exam to determine the extent of knee damage also may done. You'll undergo a full medical exam, including blood tests, an electrocardiogram and a urine test, before surgery. Knee replacement surgery requires anesthesia to make you comfortable during surgery. Your input and personal preference helps the team decide whether to use general anesthesia, which renders you unconscious during the operation, or spinal or epidural anesthesia, during which you are awake but can't feel any pain. Create a complete living space on one floor since climbing stairs can be difficult. On the day of surgery, your doctor attaches several monitors to your body to help make sure that your heart rate, blood pressure and blood-oxygen levels stay at safe levels throughout the procedure. These monitors may include a blood pressure cuff on your arm and heart-monitor leads stuck to your chest. Artificial knee joints used in knee replacement surgery are typically made of metal and plastic. Metal alloy parts replace the damaged thighbone and shinbone. High-density plastic on the shin component replaces lost cartilage. During the procedure, your knee is in a bent position so that all surfaces of the joint are fully exposed. After making an incision between 6 and 12 inches (15 and 30 centimeters) in length, your surgeon moves aside your kneecap and cuts away the damaged joint surfaces. Your surgeon takes measurements to ensure a good fit for your new prosthesis and smoothes your bones' rough edges. The surgeon then inserts the prosthesis. Before closing the incision, he or she bends and rotates your knee, testing and balancing it to ensure that it functions properly. Expect knee replacement surgery to last about two hours. Some people choose to have both knees replaced at the same time. Whether this improves the outcome of surgery or whether surgery on both knees is more risky is controversial among surgeons. Discuss your concerns with your surgeon. After surgery, you're wheeled to a recovery room for one to two hours. You're then moved to your hospital room, where you typically stay for several days before going home. You may feel some pain, but nerve blocks and medications prescribed by your doctor will help control it. The day after surgery, a physical therapist shows you how to exercise your new knee. To help regain movement, you may use a device called a continuous passive motion machine, which slowly moves your knee while you're in bed. During the first few weeks after surgery, you're more likely to experience a good recovery if you follow all of your surgeon's instructions concerning wound care, diet and exercise. More than 95 percent of people who have a total knee replacement experience significant pain relief, improved mobility and a better overall quality of life. Talk with your doctor about what you can expect from knee replacement surgery. Three to six weeks after knee replacement surgery, you generally can resume most normal daily activities such as shopping and light housekeeping. Driving is possible in four to six weeks if you can bend your knee far enough to sit in a car and you have enough muscle control to properly operate the brakes and accelerator. After you've recovered, you can enjoy a variety of low-impact activities, such as walking, swimming, playing golf or biking. But higher impact activities, such as jogging, skiing, tennis, and sports that involve contact or jumping, may be out. Talk to your doctor about your limitations.